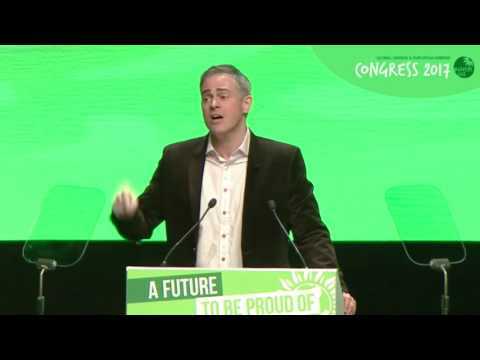 Jonathan Bartley is co-leader of the Green Party. He first joined the Green Party after hitting headlines during the 2010 general election when he confronted David Cameron over his plans for disabled children. Jonathan has spent his time as co-leader of the Green Party championing disability rights, campaigning on the refugee crisis and calling for an end to indefinite detention. He has stood alongside grass roots activists across the country with their fights against fracking, HS2 and other threats to our environment. A descendant of Irish farmers on one side and Quaker prison reformer Elizabeth Fry on the other, Jonathan has a passion for social justice and studied Social Policy at London School of Economics. He worked in Parliament on a cross-party basis from 1994-1998 and used that experience in his roles as vice chair of the electoral reform society and vice chair of Yes to Fairer Votes campaign during the 2011 referendum. He has also served as chair of Centre for Studies on Inclusive Education and helped establish the Accord Coalition with British Humanist Association and teaching unions to reform faith schools. In 2000 Jonathan set up an online charity that has since raised over £1 million for work in the global South. A proud Dad of three children, Jonathan spends whatever free time he has gigging with his band, the Mustangs, and was nominated for Blues Drummer of the Year Award in 2010.